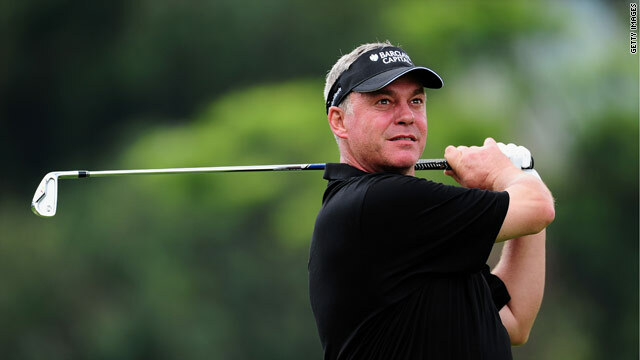 Darren Clarke is in a fine position after the first round of the Joburg Open with an eight-under 63. (CNN) -- Former Ryder Cup hero Darren Clarke and in-form Charl Schwartzel set the early pace in the Joburg Open with eight-under-par 63s in the opening round of the European Tour event. The playing partners tore into the West course at Royal Johannesburg and Kensington and home hope Schwartzel, who won last week's Africa Open, was eyeing a 59 at one stage. He birdied the eight of the first 11 holes until he double bogeyed the 450-yard 12th. But two further birdies regained the lost shots, while Clarke, who was out in five-under 31, picked up three more coming home. Northern Ireland's Clarke, the hero of Europe's K-Club triumph over the United States in 2006, is desperate to regain his place in Colin Montgomerie's team for the 2010 Ryder Cup clash this autumn. Schwartzel, who is the early leader in the Race to Dubai, is bidding for his fifth European Tour win on the final leg of the South African swing. Other early starters also fared well in good conditions for scoring, with Scotland's Alastair Forsyth in third place on seven-under with veteran Englishman Barry Lane, who was playing the tougher East course, well-placed after a six-under 65. Players alternate between the two courses for the opening two rounds before the weekend action on the East. Lane, who is one-year short of Seniors Tour golf, carded seven birdies in his 649th Tour event, second only to Sam Torrance in the all-time list.